A really fast post today... I've gotten wraped up in a book and I didn't get much else done today. Its called Blind Side and its about the evlolution of the game of Football. I'm having trouble putting it down! So I put together this quick card to finish off my collection of cards using Fresh Florals Designer Series Papers (DSP) Check back tomorrow when I share a photo of all 8 cards designs in this series. Today's card again uses Fresh Florals and Berry Burst cardstock...again, as my previous cards have. There's just something regal and rich about this new Berry Burst In Color that I'm really loving. Although I like all of the In Color designs in the Fresh FLorals Designer Series Papers, the Berry Burst has captured my creative focus for the past several posts. Today's card uses the hearts and flowers stamp from the Blooin' Love stamp set with the Fresh Florals Designer Series Paper. In addition to Fresh Florals, the image blocks and matts are Whisper White and Berry Burst cardstock. The squares for the images were cut uing the Stitched Shapes Framelit dies for the Whisper White layer and the Layering Squares for the matt. The Thank You is from the Floral Phrases stamp set. I cut one of the Delicate WHite Doilies in half and tucked it under the banner. The second stamp set used for the sentiment on the right, below, is from the Sheltering Tree stamp set. I accented the flowers in the stamped images with a few Rhinestones to add some bling to the card. 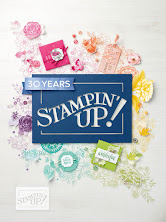 Stampin' Up!issues an annual catalog, which was released June 1. You can purchase from this catalog until May 31 2018. Use this link to download a free .pdf of the new catalog. 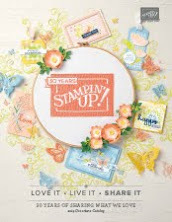 Earn an additional $35 Stampin' Rewards with this promotion. Order a copy of the catalog. 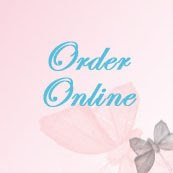 Add item number 146113 to your next order. The catalog is $5.00. 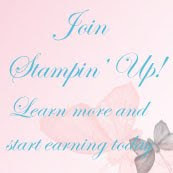 If your order total before shipping and taxes is over US$150 you'll qualify for stampin' rewards -- free merchandise you select and add to your order -- and you can earn more for orders over $350. Show your catalog to a crafty friend, order together, and share the extra Stampin' Rewards. During this class, we'll make 7 cards and a 5 X 7" frameble flag (frame not included) shown in the above photo, using new papers, punches, dies, accessories and inks from the recently released annual Stampin' Up! catalog. Choose general sentiments to stamp on your cards -- like the samples -- or select from a variety of sentiments you'll have available during class. You'll have fun customizing your cards and thinking how much your friends or family will enjoy receiving your special hand made creation.